Personnel announcements used to be one of the most reliable and easy forms of publicity for a company. In the years I worked at PR firms, we always sent out these type of announcements, usually including a headshot. Eventually, most of them would end up in the business section of the local newspaper, or within specialty newspapers or magazines. Getting personnel announcements in print was a good way to keep companies in the public eye, and also served as a morale boost to the new or promoted employee. Even 20 plus years later, I still have the clipping from Adweek showing my appointment to Boston ad firm Houston Effler (now defunct). Apparently, those days of easy publicity are coming to an end. 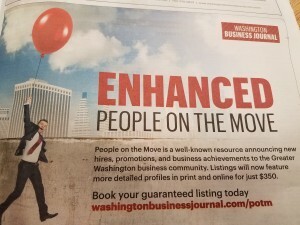 A few weeks ago I noticed that the Washington Business Journal changed its personnel announcement page (called “People on the Move”) to show the words “paid advertising” at the top. Effectively, the Business Journal had started charging companies in order to publish these announcements. As someone who has worked in communications for more than 20 years, I am not surprised that this is happening in 2017, but I am disheartened, and pessimistic about the future of media relations. It’s not surprising simply because print publications are struggling with declining subscriptions and reduced advertising, and they are looking for additional revenue. Charging for personnel announcements seems harmless, and if companies want to highlight their new hires, perhaps they won’t hesitate to spend a few hundred dollars (the Business Journal is charging $350 for an “enhanced” profile that will appear online and in print). It’s disheartening because it has further blurred the line between advertising and editorial content, and opens the possibility up that companies will be willing to “pay to play.” If there is money to be made from charging for what was previously known as earned media, then there is no incentive for publications to cover any press release or announcement unless it is major (e.g., new iPhone). The pressures on print journalism have been covered before. We know that people are not buying or subscribing as much to print, and we know that publications are asking fewer reporters to produce more content, more often, and with fewer resources. Most publications have a digital presence, and many struggle with instituting a pay wall for readers to access their content. It may seem trivial for a publication to charge for personnel announcements, but it points to a much larger problem and also to serious consequences for editorial integrity. 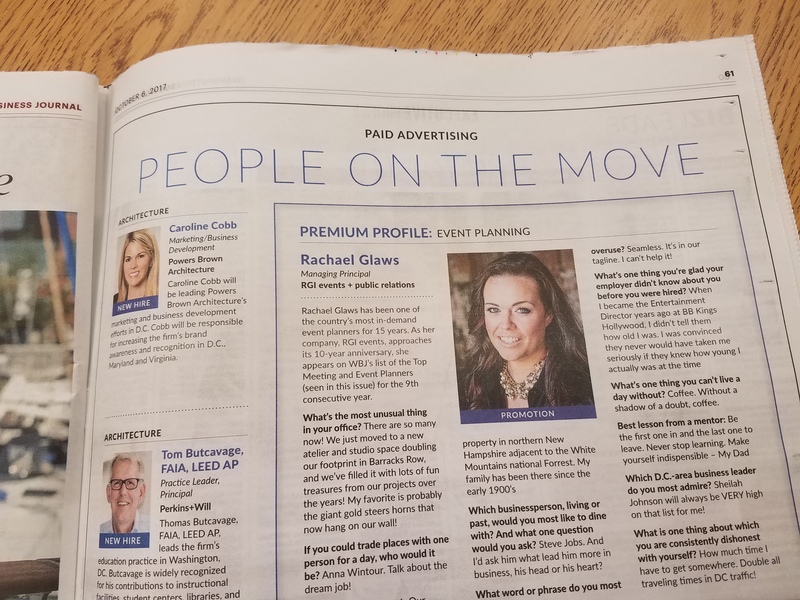 It’s not only happening in print. Broadcast also seems to require more revenue than what it is getting from traditional advertising. More people are getting news from websites and social media sites, and fewer are watching the evening news. Over the past several weeks, I’ve noticed a trend in which national restaurants are getting local news to cover food and drink specials, not only on air, but on social media channels. For a specific example, just last Friday, I noticed that WJLA (the ABC affiliate in Washington, D.C., owned by Sinclair Broadcasting) re-tweeted one of its local reporters, Kevin Lewis, discussing a special on a drink offered at Applebees, the national restaurant chain. Lewis included a link to the “news” about this special on the WJLA website, which then linked to a press release directly on Applebees website. At no point did the words “sponsored” or “paid advertising” show on the tweets or on the press release. If the WJLA news team thinks that sharing drink specials from a restaurant is actual news, they are not familiar with real journalism. In this era where journalism is being called “fake news” whenever it digs up inconvenient information for a politician, it is not a good look to get money to run publicity, without even acknowledging that it is paid. Do you have an internal communications program?